Though I am loathe to give up top billing to YellowWallFarm.com—about my favorite thing I get to do is shine light on the good and beautiful in the world…well, I've got a barrelful here for Hellman's® and their completely ludicrous and cynical misuse of the words "real ingredients" when listing what actually goes into their products. I am aware that Hellman's and Best Foods are the most popular mayonnaises in this country. I am also aware that some people eat ground beef at Taco Bell and McDonald's, so clearly we are a nation who likes to play fast and loose with our food safety. "So. Hellman's Mayo has an ad campaign claiming they're making it from real ingredients. Here's the nutritional info: http://bit.ly/bWPawC"
And that's when my insta-cynic knew I was about to launch out the gate for a horserace to be the first to find out…WTF, HELLMANN'S? Real Food or Caloric Entertainment? #FAIL, Duncan Hines! First: apologies for the wacky formatting of this post. Typepad launched a "new and improved" interface that is a colossal failure. Pictured here: a beautiful artichoke display from Prevedelli Farms at the Food & Wine Farm to Table Harvest in Carmel on September 26. I went with Cynthia Sandberg as her VIP guest, and it was glorious. Because this is what real food looks like. Recognizable as food, not some Frankensteined mix of "ingredients" that have been machinated to lose all resemblance to something that nourishes your body cells and well-being. If you've read this blog for any length of time, you know that I don't suffer fools gladly, especially on a day when I'm so grouchy that I could kick something for the pleasure of the pain to my foot. And you know that, on a few occasions, someone pimping promoting some fake-food item to ME has caused my innate cynic to haul out the Whack-a-Mole on them. 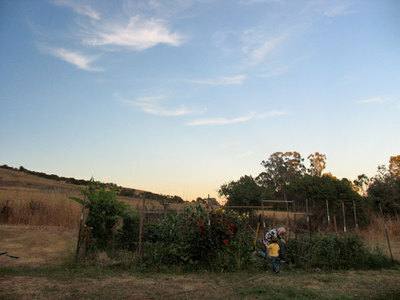 I first met Leon in 2007, at the UCSC Farm. He was helping with the annual Harvest Fair, and went out of his way to be helpful to everyone, with enthusiasm, intelligence, and what I know now is his characteristic warmth. Leon impressed enough people at the farm that he was chosen to be one of a handful of apprentices asked to stay through the winter, and mentor the next year's first-year apprentices. This honor is bestowed upon a very committed group of young people, and after his tenure as a Second-Year (or "Seconds," as they're called), Leon decided to stay in the area instead of returning to New York, so that he could join the Board of Directors for the Friends of the UCSC Farm & Garden. New York's loss is very much our gain. Being on the Board is not the predominant reason Leon stayed in Santa Cruz, I have to confess. He was hired to manage the farm by Rich and Laura Everett, owners of Everett Family Farm, who clearly recognize Leon's capacity to turn vision into reality. I'm overdue for an update on the goat-wrangling and other activities that are part of the Everett's farm—one of the prettiest little farms you'll ever see. But I am remiss on weeks of writing, so I'll catch this lightning in a bottle while I can. It feels good to write. Pictured here: some of the beautiful hand-picked zucchini blossoms carefully tended by Leon, just a couple of miles from my house. Leon's specializing in these at the farmers markets—I don't think anyone else has them. If you can't get to them at the local farmers markets (Felton on Tuesday; Westside Santa Cruz on Saturday; Live Oak on Sunday), visit the farm in Soquel at 2111 Old San Jose Road, where their farmstand is open daily. Leon brings to his work a culinary history (along with a Masters Degree in Sustainable Development), including a stint as a waiter/educator at Blue Hill Stone Barns in upstate New York. He cooks, cans, makes spice blends, and a whole lot of other stuff I can't even name: his skills in the kitchen are matched by his zest for life. Most of our conversations are food-centric: he's often asking me for my take on flavors, combinations, things to grow, and so on. "Value-added" is an understatement, when I view Leon's approach to farming. Even my ex-husband, whose previous forays into the kitchen involved can openers and frozen entrées, has become an adept cook since his divorce. He's taking pleasure in learning how to shop for fresh produce. Well, more pleasure than he took before, let's say. I don't think he'll ever spend time pondering whether to buy peaches or blueberries, or to try the Ronde de Nice squash instead of plain (beautiful, dark green) zucchini. So where's the rant, you may be wondering. I needed a good rant to get me out of the creative trepidation I've been experiencing, and a Media Relations employee for Whole Foods Market unwittingly handed it to me yesterday. Bless her heart: I won't name her, for she did nothing wrong. All she did was invite me to the opening of the second Whole Foods Market in Santa Cruz county. She had no idea she threw a lit firecracker into a pile of dry kindling. Bless her heart. And now, a miniature rant, not without heart or reason. 1. Santa Cruz is the last place on earth that needs a Whole Foods Market, much less two of them. 2. Whole Foods doesn't know Santa Cruz. A recent radio ad mentions the store's location on "Soquel Boulevard." Locals know there is no such street: the store is located on Soquel Avenue. Soquel Avenue runs from downtown south, until it crosses Highway One, when it becomes Soquel Drive. A moot point? Simple fact checking. And yes, this is a very minor point, but the ad irks. And where is the store located? One block away from Shopper's Corner, which naturally has to have a negative impact on that venerated business. 3. Of all the counties in California, only San Francisco is smaller in size (and has over three times our population) than this county. Maybe San Francisco needs a Whole Foods—though I think there are better options, certainly with the farmers markets. With our county's population at roughly 250K, I don't see the need for a megamart like Whole Foods. Much less TWO, that are literally THREE miles apart. What was it like at Whole Foods (in Monterey)? I spent only $30, and part of that on medicine. My overall impression is that people are dazzled by all the choices—six artisanal bakeries with offerings up to your eyeballs!—but I don't need all the choices. My local natural foods stores (New Leaf Community Markets and Staff of Life) have ample variety in every regard, and what they don't have (a vast wine selection, e.g. ), I can easily augment elsewhere. I wouldn't buy produce at Whole Foods, when it's so much cheaper at the farmers market, but if that's what people want to do, and are willing to do, and need to do, bully for them. For myself, I didn't have a single pang of envy or the feeling that I was missing something in never having been inside a Whole Foods, nor do I have any desire to return. I saw what all the fuss was about, and I don't need the fuss. Santa Cruz is covered. Razzle dazzle isn't for me. 4. People don't call it "Whole Paycheck" for nothing. This is a universal nickname that isn't even a cliché. I saw tomatoes (in season) for $6/pound, when they were at that time selling for $2/pound at local farmers markets and farmstands. Can you spell "mark-up"? 5. I love my farmers, and I love my farmers markets. This is really the heart of it. Going to the market is like going to church for me. The good kind of church, not the kind where they want you Scared Straight! I see so many of my friends, meet new ones, and love the wholesome vibe—kids, music, pretty and healthy food grown with love. I like knowing and talking to the people who grow my food. Another case in point: not knowing the research or facts on pesticide use on avocados, I asked one farmer, the father of two young children, "Would you let your kids eat [this, that, or the other thing?" He said "yes" and explained his rationale. The "yes" would have been enough: I trust Josh Thomas, of Thomas Family Farm. They've been farming sustainably since 1971; his father, Jerry started it way back then. 6. When I buy from the farm, the farm gets all of the money. Whole Foods doesn't pay the farmers what they would make from direct sales. One family farmer told me that their direct sales comprise more than 95% of their income, between the farmers markets and the farmstand. You get the point(s). Yes, I realize that Whole Foods is providing jobs, but I doubt those jobs offset the loss of income that would otherwise go to our local economy. Now, if the CEO of Whole Foods wants to move to Santa Cruz, maybe I'd shop there. No, no can do. See reasons 4, 5, and 6, above. Sorry, Mr. Mackey! Where I'm transparently hypocritical: I buy some things at Safeway (toilet paper, etc., only things on sale with my Club Card). I buy some things at Trader Joe's (knowing it is owned by German brazillionaires*). I buy a very few things a few times a year at Costco. I shop BevMo's 5-Cent seasonal sales (for California wines). 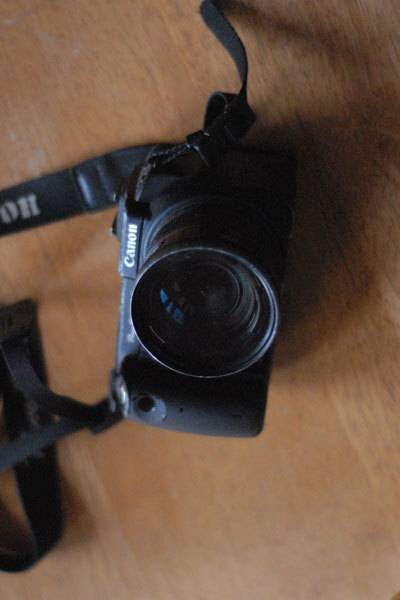 I buy my work tools (computers, cameras, etc.) where I can get the best price, usually online. Most of these things don't affect the money that I spend on locally farmed/ranched food. I guess what I'm saying is I don't need another outlet to spend money that won't stay (mostly) in our local economy. My hypocrisy does know some boundaries, you know! And so I conclude this with the simple thought that originated I Heart Farms. Where is your pretty, little farm? Who is your pretty little (big, hairy, short, young, old, rustic, etc.) farmer? Mine are all around me, in the open air. And that is exactly as I like it. Farmers: they do things worth writing. An advisor comes up to George W. Bush during a meeting and whispers, "There has been a riot in Rio de Janeiro, and six Brazilians are dead." Bush asks, "How many are in a brazillion?" Slow Food Notion: I Don't Think So. 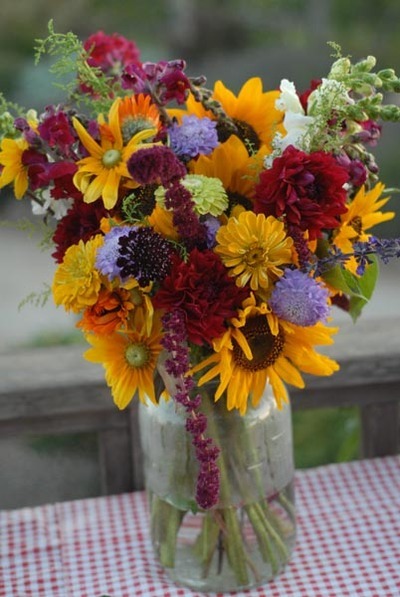 Pictured here: a bouquet created by the apprentices up at UCSC's Farm & Garden (aka "CASFS") for a dinner last night. I shopped, chopped (500 cherry tomatoes, eight pounds of yellow wax beans), cooked (the beans), and prepped for eight great hours. So, unlike tens of thousands of people in San Francisco who are paying $58 and up for the privilege of suffering through traffic and parking and being crammed into buildings like sardines, I am absolutely committed to avoiding all things under the Slow Food umbrella this Sunday. Slow Food Nation: Come to the Table 2008 starts tomorrow. When I first heard about it, it sounded exciting. But I realized I was Having Thoughts about it, and that most weren't pretty. Turns out I'm not alone. (I might not be in the majority, but that doesn't matter.) With her usual graciousness and aplomb, Jennifer Jeffrey (who lives in San Francisco) wrote her plus-minus take on the event. She manages to find the possible positives, which honestly would have eluded me. NEVER Buy Glacéau Water, or "My $1000 Paperweight"
A few weeks ago, it was perishing hot: this was on the day the big fire started in Bonny Doon. I was with my daughter at the downtown farmers market, and a friend asked me to pick up a bottle of cold water for her. Since the heat was staggering, and my own refillable bottle was empty, I got myself a bottle, too. I hesitated when picking out a bottle of Glacéau Stupid Smart Water, but it was the coldest one on the shelf, and that's what I sought. The hestitation came from an earlier incident, when I put a closed bottle of their water in my giant tote, and the top slid open just enough to leak water. My make-up bag got wet, and some receipts, but it was nothing fatal. I drank about half the bottle as we walked up the Pacific Garden Mall, and made sure the cap was "closed" before I slipped it, in an upright position, into my bag. Twenty minutes later, I felt something cold dripping on my leg, and my heart sank. 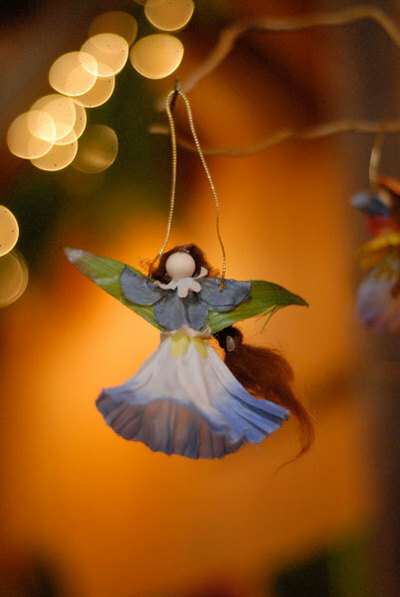 Pictured here, a Christmas fairy, which is the creation of a young woman named Roisin, a ten-year-old artist living in Pescadero. Roisin's Christmas fairies were the hit of the holiday fair at Harley Farms Goat Dairy: she sold every last one of her unique creations. I'm the happy owner of one myself: it's on our Christmas tree with a blue lightbulb up its skirt. I'm going to take a break from the Delicious Treats student memoirs to bring a bit of news about the Santa Cruz Homeless Garden Project. Being a coastal city with a mild climated, Santa Cruz has a fairly large homeless population. In 1990, the Citizens Committee for the Homeless here in Santa Cruz started a small quarter-acre garden on the west side of town, providing "job-training and meaningful work in a therapeutic environment." (That's from their website.) It's a fine, fine organization which has changed the lives of many people—both homeless people who received the benefit of the education and work, as well as the myriad volunteers, staff, and now the families who are the recipients of the weekly CSA baskets. I was reading the Santa Cruz Sentinel (affectionately or irritatedly called "The Senile" in these parts) last week and read with a sinking heart that the Homeless Garden Project has twice been the victim of arson. The fires, lit exactly one month apart, destroyed a storage shed containing all their hand tools and most of their seed, and on Sunday night, their kitchen. Every Tuesday through Friday, the kitchen provided two hot meals for anyone who volunteered or worked that day: imagine its destruction. I am horrified, especially because the implication is that the fires were deliberate, targeted, and filled with malice. At Christmas time. To make a long story short, I donated five boxes (250) of my farmers market calendars to their store in Depot Park, over near the Boardwalk. If you are in the area and want to make a difference, and get a beautiful calendar (or beeswax candles, preserves, knitted goods, or dozens of other items—very high quality stuff), please visit the Homeless Garden Project store as soon as you can. They're organic, and they're committed to providing the best service and products possible to our community. That's all for now: I'll return tomorrow with another memoir from "The Meaning of Food" writing class. Thanks for visiting. And thanks for visiting the Homeless Garden Project's store, located near Depot Park. I'd call them for directions, as it's easier than trying to find it on a map: 831.426.3609. Great site! Being a North Dakotan, I definitely support the farming way of life. I took a glance, already knowing I'd find some B.S. marketing apparatus at the "weblog," and was instantly gratified in my suspicions. I wrote back to Kristen: "He doesn't look organic. Am I wrong?" Seven minutes later, she replied, "I can't say whether he is organic or not, but given the choice between organic and local, I'll take American grown anytime. What's your stance?" Folks, this is urgent. Please take a little time out from your day to contact lawmakers, to undo the grave legislation that would decimate the raw milk industry in California. You can do that with information at the first link, and read more about the situation at the second link. Here is a letter from Ron Garthwaite, owner of Claravale Farm, which is pictured above. Well, it's his former location that I once visited: last year was rough for Claravale, when their lease was yanked unceremoniously so the owners could get a higher-paying tenant on the land. Relocating to San Benito County after having spent tens of thousands of dollars in legal fees, trying to get the permits necessary from the visionary-impaired bureaucrats in Santa Cruz County, Ron built a new dairy facility that cost about $1M. What's made AB 1735 especially shocking to Ronald is that he was submitting plans and having inspections by the California Department of Food and Agriculture during recent months. “Had they informed us of this new regulation we could have made changes to the facilities in order to have a better chance of meeting the new regulation,” he says in an email he just sent to his customers. “Or we may have decided not to build at all. Or we may have decided to construct it to produce products other than raw milk. 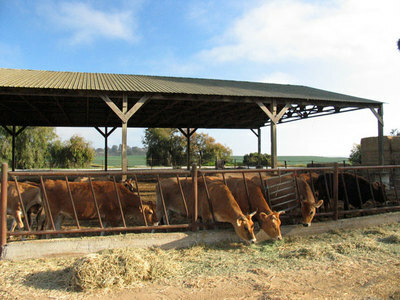 If you want to continue to be able to obtain raw milk in California you should fight this law with everything you have. Even if you are not a raw milk drinker but want to be able to get fresh, unadulterated produce or meat or, in fact any fresh food in the future you should be fighting this law. This is only one additional step in the State’s campaign to pasteurize or sterilize everything. On behalf of the raw milk dairies in California, I thank you. For the friend who wrote me this morning: "Aw Tana, you sound beleaguered. Don't give up! I know I don't comment much anymore, but I still love reading you. Just give us photos when you're tired." Thanks, B. These are for you. 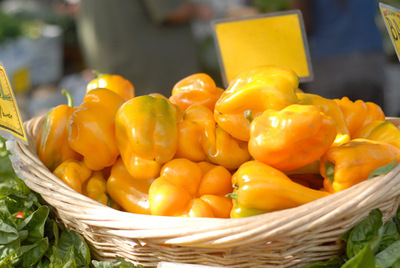 From last week's downtown farmers market: Route One yellow bells. Summer's last gasp? It's raining and grey outside today. The most recent comment on my weblog is from David, who asks, "What did you amend the soil with?" This is straight from Linda Butler, whose plants up at Lindencroft Farm resemble ornament-heavy Christmas trees. Here is a list of soil amendments I use. For 100 square feet, apply 2.5 pounds of blood meal, 4 pounds of rock phosphate, 3 pounds of green sand, and 5 pounds of oyster shell powder. This I use when I work the soil for the first time, when I make a new bed and fill it up. I dig this all in the first foot. Then just before I plant in the new soil I add about one pound each of fish meal and kelp meal and work it into the top six inches. When I harvest and then get ready for all subsequent plantings or sowings I add generous amounts of compost and a little more fish and kelp meal. If I'm sowing carrot seeds I work some worm castings in also. All the leafy vegetables that we harvest for their leaves like broccoli, kale, chard, spinach, lettuce, and brussels sprouts, I give a fish and kelp about once a month in the form of a dilute emulsion. I just dump about a half a gallon of each around the base of the plants for the big ones. The small ones like spinach, chard, kale, and lettuces get a foliar feeding of the same fish and kelp emulsion. Monica Bhide on Throwing in the Trowel? ronelle on Throwing in the Trowel? joanne firth on Throwing in the Trowel? Hyperlocavore on Throwing in the Trowel? VERY HIGHLY RECOMMENDED: Subscribe with Bloglines! EdibleCommunities.com: it doesn't get better than this. GastroGear: Because cooking naked hurts. GetShirty.net : My irreverent designs to wear and use. Photoblogs.org: I support better photography on blog sites. The NEW FARM: "Farmer to farmer know-how from the Rodale Institute"